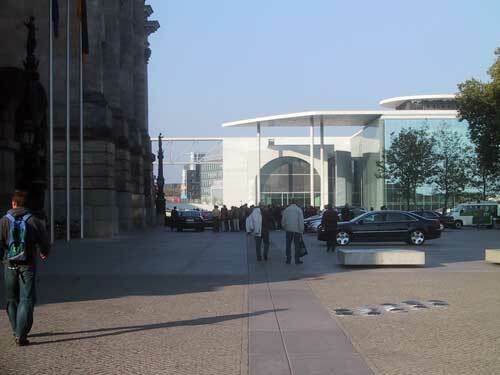 In Germany, the entrance to the Reichstag (parliament/legislature) building is right there on a street, where taxis and bicycles ride by (but no private cars), and regular people can walk right up and say hello to the top leaders walking out to their black chauffured cars. 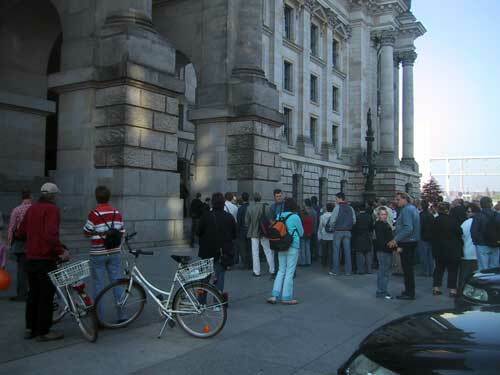 Reichstag eastern entrance, with a line visible where the Berlin Wall once stood. The Marie Elizabeth Lüders Haus is in the background. The British are a bit more paranoid. 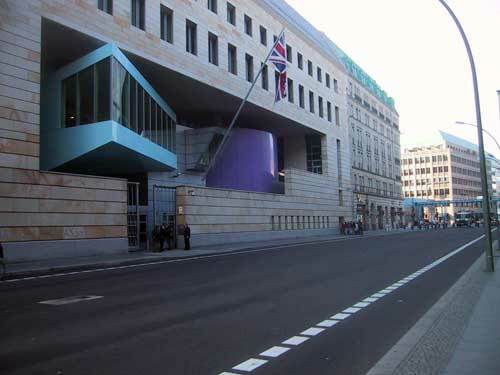 Their embassy is on a public street, but it is closed to all vehicular traffic, with police and barricades at either end of the block. 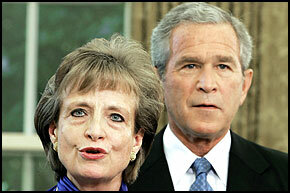 For a couple of minutes, I had a post up about Harriet Miers, the new Supreme Court nominee, being a board member of Exodus Ministries. According to Law Dork, via Wonkette, this is not the "Freedom from homosexuality through the healing power of Jesus Christ" organization, but a Dallas based-organization which "seeks to encourage ex-offenders, to reunite them with their families, and to empower them to become self-sustaining, productive, Christ-centered members of society." No word yet on what they do with non-Christian ex-cons. Experience: 2004-present, White House counsel; 2003-2004, White House deputy chief of staff for policy; 2001-2003, White House staff secretary; 1995-2001, chairwoman, Texas Lottery Commission; 1972-2000, private law practice; 1992, president, Dallas Bar Association; 1989-1991, member, Dallas City Council; 1985, president, Dallas Bar Association. According to Atrios, even some right-wingers thing she's a joke. James heard about the nomination today and said, "She can't possibly get approved." My response was, "Justice Thomas. There is nothing you can't get on the Supreme Court these days." This page is an archive of entries in the Politics category from October 2005.